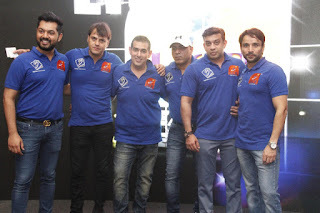 The grand players auction of UNITED CRICKET BASH SEASON 3 was held at Tajs lands End. The 3rd season of United cricket bash kick starts from 10th of April at Om Astro Turf Juhu with its final to be held on 14th May 2018. Entertainment were ecstatic with the interest displayed by the owners of 16 teams which are taking part in the tournament. "I am baffled with the meticulous planning with regards to the game of Cricket among the team owners. Each of them were fully prepared and had chalked out perfectly planned strategies as regards to the pros and cons of each player while bidding," exclaimed Karan Tandon.